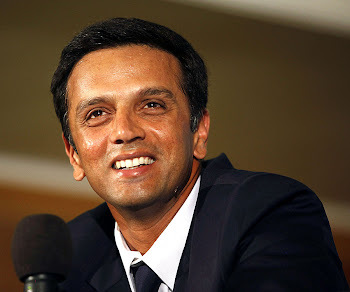 Former Indian skipper Rahul Dravid, who was honoured by the Karnataka State Cricket Association (KSCA) for his outstanding contribution to Indian cricket, said he was honoured to be associated with six legendary batsmen including Sachin Tendulkar, Sunil Gavaskar and Brian Lara in the exclusive club of scoring 10,000 Test runs. The other two in the 10,00-run club are the former Aussie captains Allan Border and Steve Waugh. "I am truly honoured to be associated with such legends and when I was told about a wall being erected at the Chinnaswamy Stadium to encourage youngsters from achieving their dreams by the KSCA secretary Brijesh Patel, I was really humbled. It is a great experience to be amongst so many outstanding personalities who have gathered here and I don't have words to describe the feeling," Dravid told the gathering before the 'The Wall' was unveiled by master batsmen Sachin Tendulkar on Monday. "My sincere thanks to Sachin (Tendulkar), Anil (Kumble) and Venky (Venkatesh Prasad) and all the other cricketers from Karnataka who have gathered here on this special occasion," Dravid, who was accompanied by his parents, added. Tendulkar unveiled 'The Wall', a unique 27 by 15 feet structure next to the main gate of the stadium, conceptualized and built by Skyline Group. 'The Wall' has many interesting features. It comprises 10,000 units that represent David's 10,000 plus runs in both forms of cricket (Tests and ODIs). The highlight of 'The Wall' is a large metal statue of Rahul Dravid playing his trademark cover-drive. There is a live electronic unit, at the right-hand-top-corner of the wall, which displays Dravid's current score in Test cricket, even as he keeps the scoreboard ticking. It is always a happy occasion to see Dravid on the batting team as he is the best among the world batting squad. His records is not just a wall it is an Himalaya which cannot be changed by any one in the world. Let his strength gives India more and more runs to Indian Team.